At the southern end of German Village is Schiller Park, named after Friedrich Schiller. The area was originally known as Stewart's Grove, but was renamed City Park when the City of Columbus purchased the land. In 1891 the German-American residents presented the statue of Johann von Schiller to the city where it was erected on the west side of the park which served as a community meeting ground for the German settlement. During World War I, anti-German sentiments quickly arose across the country, including Columbus. Residents here pressured City Council to rename the park to Washington Park. 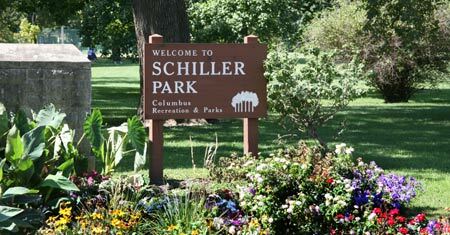 After the war, at the request of many of the German-American residents living in German Village, the park was once again renamed Schiller Park. 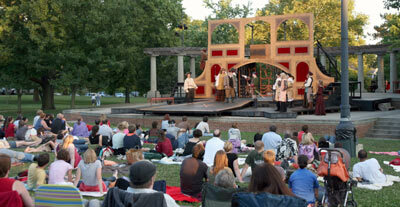 Today, the site has recreational facilities, gardens and an amphitheater, which hosts free live performances of Shakespearean plays during the summer months courtesy of The Actor's Theatre. It is not clear why the community donated the statue of Schiller to the park other than it may be because Johann von Schiller was a poet and one of the poems he wrote was called "Columbus." 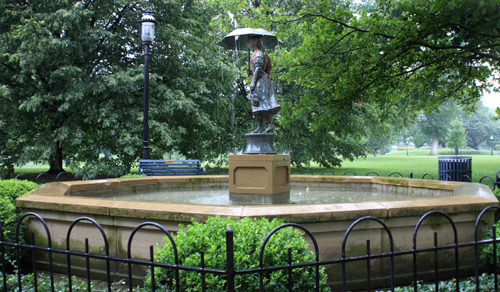 A recent addition to Schiller Park is The Umbrella Girl fountain and the Grace Highfield Memorial Garden which were dedicated in 1996. 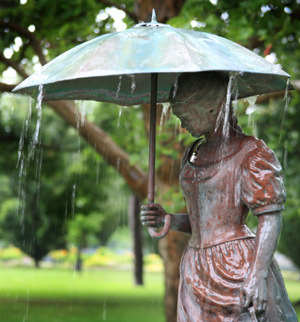 The Umbrella Girl has a long history with Schiller Park until the statue was stolen during the 1950s. The original sculpture was installed in 1872 as a drinking fountain, complete with tin cups for those seeking to quench their thirst. That statue was located further south from the current location, next to the brick cottage located at Stewart and City Park. When the statue came up missing in the 50s, an exhaustive search was conducted to find the missing statue, but without results. 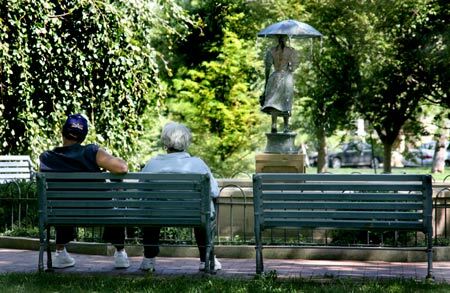 Year later, Joan Wobst, a Columbus sculptor, offered to sculpt and donate to the German Village Society her version of a new umbrella girl. Joan used her daughter, Andi, as her model for the statue. The the young women is wearing a dirndl (a type of traditional dress worn in southern Germany) and carrying her shoes as she stands above the pool of water with water splashing down from her opened umbrella. The statue was installed in a new memorial garden called the Grace Highfield Memorial Garden. Both the statue and garden were dedicated to the citizens in October, 1996. Today, while there are no tin cups hanging nearby for a drink of water, it is still one of the most refreshing locations in Schiller Park and should not be missed if you get the opportunity of visiting the park. Classical German poet of enlightenment, dramatist, philosopher and historian. 1759 - 1805. 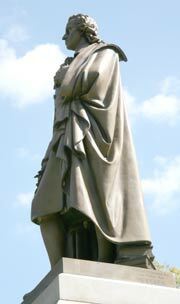 The statue was erected by the German-Americans of Columbus and presented to the city on July 4, 1891.